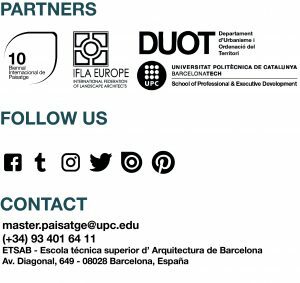 STRUCTURE – Master in Landscape Architecture Barcelona – Universitat Politècnica de Catalunya – 35ª EDITION. The Master in Landscape Architecture approached from 8 different and complementary perspectives. Each of them addresses a specific problem, for which students design different experimental solutions. The sum of these different focuses builds, at the end, an unique frame through which the student will exercise the profession. The Master’s programme is structured around 4 main modules (A. Public space, B. Green systems, C. Water sysytems and D. Tourism), 3 international intensive courses (I. The green public space, II. Water and tourism, III. Remaking landscapes) and a set of theoretical courses (Contemporary landscape projects’ critique and the Master final project). From the disciplinary knowledge of more than 150 years of design models related with the modern history of public space and after 35 years of academic experience on present day issues related to landscape, the studio investigates free space, through a contemporary prism that goes beyond urban design typologies, in order to incorporate global notions and strategies about its essence. The studio deepens in new visions starting from the point of view of landscape, ecology or art to the development of the project up to a professional level that considers detail construction as an expressive virtue. The studio’s objective, which focuses results from the perspective of the public use, as an inevitable starting point, is to deal not only with urban projects, but also with sites in the peripheries, with the sea and fluvial shores, to reinvent landscapes or to influence infrastructure projects. The studio’s curriculum related to vegetation systems suggests a new approach towards territorial processes from the perspective of vegetation. In order to do so, distinct case studies are identified which are developed at a design level with emphasis on natural processes; in this sense, besides vegetation, design focuses on soil quality, climate, hydrography, etc. ; as well as on dynamics related to urban and regional aspects or, even, to transformation processes of landscapes, usually perceived as natural. Litoral systems, fluvial borders and streams are one of the most specific issues that landscape architecture addresses, especially, in regions as the Mediterranean one. In order to design seafronts, riverfronts, marshlands, etc., approached from the perspective of the improvement of deteriorated spaces, one has, always, to deepen into the knowledge of the contact between land and water, and as a consequence, with vegetation, dealing with the issues of transformation, management and maintenance.The aim is to understand the water cycle and its mechanisms, to look at hydric systems as a way to read the territory. Professional Practice: In the first part of this course, the students will undergo an immersion period of 250 hours of work experience in some international or national landscape offices where we have a collaboration agreement. A professional tutor will be assigned to each student and welcome him or her and supervise his or her progress in the workplace. Master’s final project: The students will have to produce a research project or a final project of a critical nature and showing a holistic vision concerning all the knowledge assimilated throughout the master and specifically based on the knowledge acquired during the work experience stage. La Universitat Politècnica de Catalunya es reserva el dret de modificar el contingut del programa, que pot variar per a una major adaptació als objectius del curs.